Hook’s Cheese Company was founded in 1929 in a building built into a limestone hill that used to be a livery and stable. Their milk travels no more than 5 miles and is from small farms that each raise 25-60 Holsteins and Jerseys. The flavor profile of their cheddar cheeses comes mostly from the curing, or aging, process. The Hook’s cave can hold 520,000 to 550,000 pounds of cheese at any time. Currently they boast a 12-year cheddar, and in 2015 they will release 15 year cheddar if all goes as planned. To ensure the best quality of cheese during the aging process, Tony takes core samples of each batch to test throughout the process. 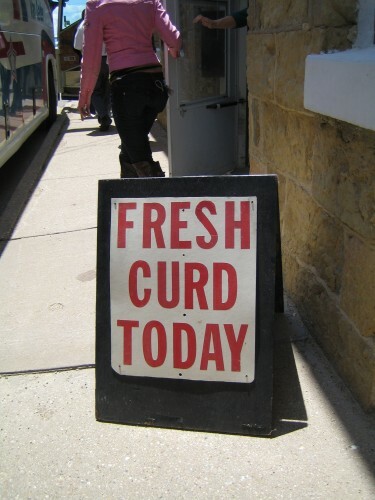 Once a cheese is at its peak ripeness they sell it. If it tastes as though there’s more smoothness in flavor to be had, they keep it in the cave and test it again. 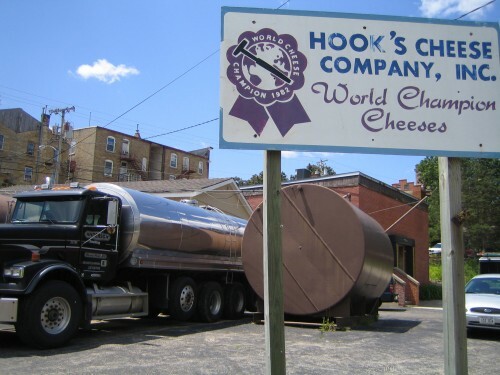 There are two main things I learned about cheese from Hook’s. In the aging process, it’s the enzymes in the cheese at work. Most people think 3-5 year cheddar is at its sharpness (acidity). However, the longer it ages, the smoother and more flavorful the cheddar becomes. The calcium lactate in the cheese crystallizes, creating a pleasant, pinprick of crunch when you bite into it. 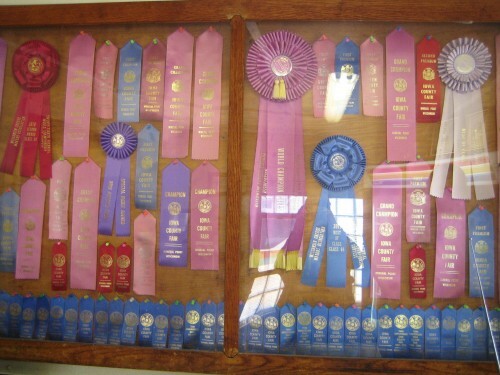 Personally, that’s my favorite part, but as we later learned at Uplands, that crunch can cost you awards. The second thing I learned at Hooks is how moisture interacts with the aging process. Most cheese is sold shrink-wrapped in plastic, and almost all of the cheese in Hook’s cave was also. If not for the plastic, moisture would be lost from the cheese during the aging process. However, this also has implications for how you handle the cheese at home. If you purchased a brick of Hook’s cheddar cheese and wished to keep aging it (why, I don’t know, as they are sure to package each batch at its best) then the best way to accomplish this would be to keep it sealed and let it hang out in your fridge. If, however, you wanted a piece of that tasty, tasty cheddar and then wanted it to keep as long as possible in your fridge, you best not touch it with your fingers. Instead, unwrap the plastic as far as you are going to slice the cheese, hold onto it by the plastic, and slice with a wire. Make sure not to touch it with your fingers, because the oils and moisture on your skin will make it mold faster. Squeaky cheese curds in 7 different flavors, and have plans to add an 8th, wasabi, soon. 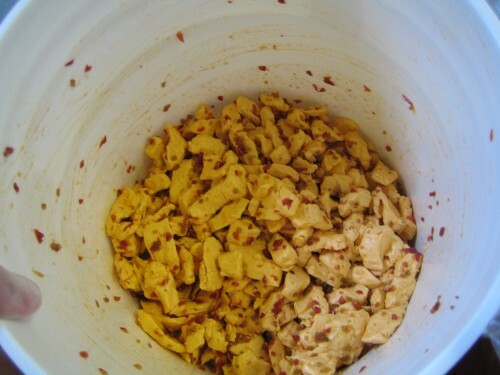 They flavor them all by hand in big tubs (yes, tubs of curds) and package them by hand for local farmers markets. Hidden inside inconspicuous buildings is tons of delicious cheese. Literally...tons. Surely heaven is a tub of fresh, squeaky cheese curds. 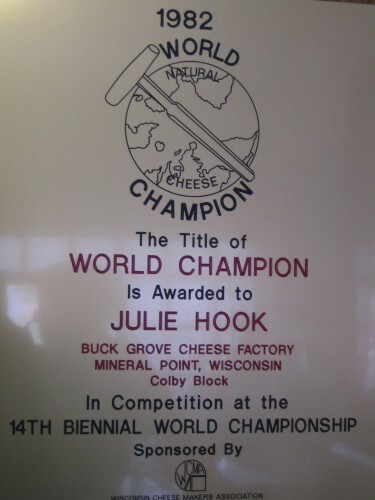 This entry was posted in WI Cheese Tour and tagged 12 year cheddar, aged cheddar, cheese, Hooks Cheese company, Mineral Point, WI Milk Marketing, Wisconsin. Bookmark the permalink.